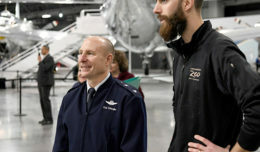 From left: Maj. Gen. David Harris, Air Force Test Center commander; Staff Sgt. 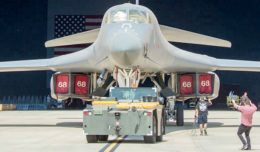 Jacob Cumbo, 812th Civil Engineering Squadron Explosive Ordnance Disposal Flight; and Chief Master Sgt. 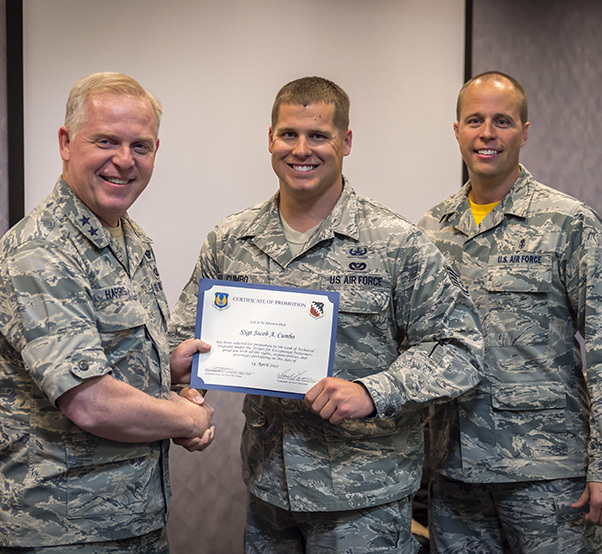 Christopher Lantagne, AFTC command chief; pose for a photo after Cumbo was presented with a promotion certificate to technical sergeant April 14, 2017. Cumbo was promoted through the Stripes for Exceptional Performance program, which recognizes and promotes outstanding Airmen. Airmen can be STEP promoted to the ranks of staff through master sergeant. Performance packages are drafted by leadership when they recognize a member’s exceptional performance and ability to perform at the next rank. Harris and Lantagne made a surprise visit to the EOD Flight’s facility to present the honor. Additionally, EOD technicians Tech. Sgt. Colby Nokes and Senior Airman Ian Tuttle were presented with commander’s coins for outstanding job performance.